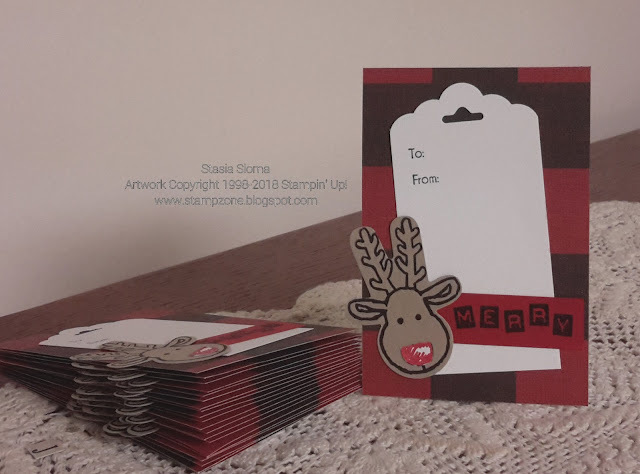 Here is my gift tags I made to put on all the presents. It looks like it is a lot of work, but the hardest part was stamping the Rudolph nose and cutting it out and putting it on top of the reindeer. The rest was pretty easy once you got in a grove. The stamp sets used were the Cookie Cutter Christmas, the Labeler Alphabet and the to and from a retired stamp set called Tags & Trimmings. The top was punched with the gift tag punch and the paper is The Paper Studio.